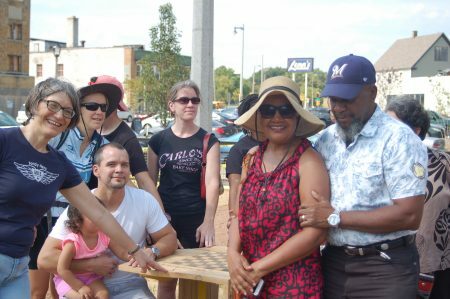 Editor’s note: This article is one of an occasional series profiling the 12 finalists for the Milwaukee Awards for Neighborhood Development Innovation (MANDIs). Fondy Park is a finalist for the Brewers Community Foundation Public Space Award, which recognizes public space that helps build community. For more than a decade, the city-owned lot on the corner of Fond du Lac and Meinecke in Lindsay Heights was an eyesore. All that filled the space was a broken-down fence and a construction project that never seemed to progress. But last year, community partners transformed abandoned pieces of concrete and gravel into a foundation for a new, eco-friendly park. Fondy Park, 2200 W. Fond Du Lac Ave. opened on Sept. 16 as a project of HOME GR/OWN, an initiative of the City of Milwaukee’s Environmental Collaboration Office (ECO). ECO’s mission is to turn vacant lots into green spaces throughout Milwaukee. Fondy Park sits adjacent to the Fondy Farmers Market, the city’s largest and most diverse farmers market. Casey said when she joined Fondy Food Center in 2014, she began talking with various community partners about turning the lot into a park and performance place. 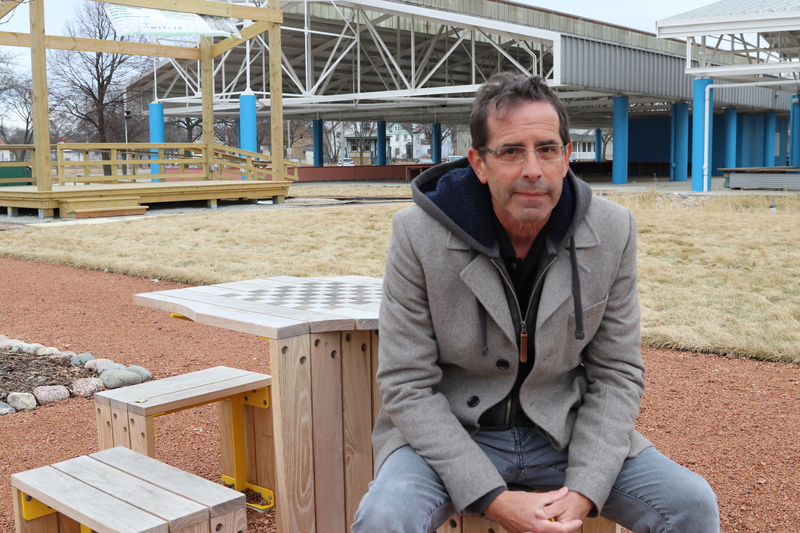 None of those talks panned out until 2016, when Tim McCollow, project manager of HOME GR/OWN, found funding through the Milwaukee Metropolitan Sewerage District to begin creating a storm water retention park. “We really like to do projects that have multiple benefits,” said McCollow. He said Fondy Park was the largest project HOME GR/OWN has ever done. In addition to providing adaptable space for the farmers market, Fondy Park also serves an environmental purpose by protecting neighborhood homes from flooding and preventing pollution in Lake Michigan. McCollow said that every square inch of the park is absorbing water, collecting 83,000 gallons of rainwater underground. “Normally you would want water to flow away from the property; we are actually doing the opposite,” said McCollow. Reflo, a Milwaukee nonprofit that supports water sustainability and green infrastructure in urban environments, helped design the underground storm water retention system. Executive Director Justin Hegarty said Reflo was excited to be a part of the project. “It builds off a lot of the strengths of neighborhood partners,” Hegarty noted. Once funds were generated for the underground storm water management system, it was easier to find funding for the above-ground elements of the park. “People saw the beauty of the project and were quickly available to raise the necessary funds to start construction in May,” said McCollow. While Fondy Park has “tremendous environmental benefits,” Elkin said she also loves that the Fund for Lake Michigan helped create a community gathering spot. “There are a lot of great things happening in that neighborhood, and this is just one more element that is helping support a really vibrant part of the city,” said Elkin. Other funders included The Zilber Family Foundation and the Greater Milwaukee Foundation. David J. Frank Landscape donated the time and materials to build the park’s fence and gravel pathways. The park’s features include an event stage, green space, beautiful plants, benches and tables with chess boards etched on the top. Casey said that the opening day for Fondy Park was “full of joy.” The park opened on Fondy Food Market’s 100th anniversary, making it all the more special. He said phase two, which will start this year, will include adding solar power to the site, putting a roof on the stage and working to get more events planned throughout the season. He said because this year will be the first full season with nice weather, it will be interesting to see how the community utilizes the park. “The Lindsay Heights neighborhood is really the premiere eco-tourism neighborhood of the city,” said McCollow. In December, Fondy Park project team members planted 2,000 daffodil bulbs. Community members should be able to see the daffodils bloom this spring. Grow MKES’s food system! Come on out and support our local farmers and celebrate innovation in water harvesting.